The world on one gear. Does it need a catchy headline? I’m Markus. I have recently fulfilled one of my biggest dreams and finished a challenging 34,000km ride around the world on a singlespeed mountain bike, starting on 3 September 2015 and ending on 27 August 2016 in the Scottish Capital. While I was born in Germany I have lived in Scotland for the last seven years and felt that Edinburgh was the right place to begin and finish such an epic adventure. No, I am no newbie to the rapidly growing bikepacking community in the United Kingdom and internationally. 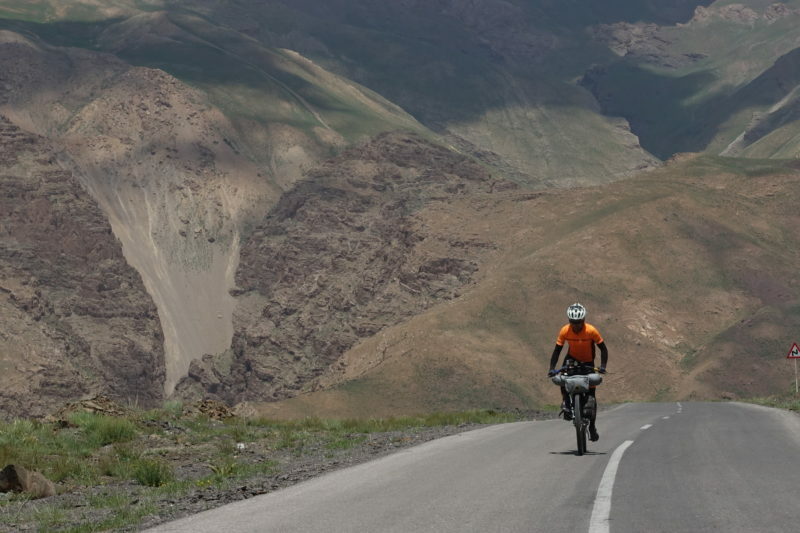 While the idea of travelling long distances on a bike is nothing new, bikepacking is different from cycle touring with panniers. We use bags strapped to the frame, handlebars, fork and saddle instead of racks and panniers, to make the overall load lighter and to extend the terrain we can explore on two wheels. I started bikepacking in 2006, crossing the Scottish Highlands and Islands with a friend on a mountain bike, with all gear stuffed in a backpack. After finishing University in Germany I moved to New Zealand for two years, and since then toured New Zealand, Scotland and Europe, since November 2010 almost exclusively on one gear. In 2010 I cycled home from Edinburgh to Schwobfeld in Germany where I grew up, in one of the hardest winters Europe has experienced recently. After 14 days through snow and ice I arrived at my parent’s home many kilograms lighter but happy. It was then when I fell in love with the simplicity of a singlespeed bike, and that love affair is still on-going. The idea for cycling the world came in 2009 when I moved back to Scotland after living almost two years in Wellington. On my last night in the pub I said goodbye to my friends and promised to be back soon, but on my own two wheels for as much as I could. And so I did, arriving in Wellington after more than 10,000 km in the saddle. It was amazing to meet many of my friends back in Wellington when I arrived in January, after I had been away for almost seven years. My ride took me through 26 countries in less than twelve months. By no means choosing only one gear to tackle the distance of 34,000 km meant taking an easy route. According to the elevation data records on my GPS device I climbed around 342,000 m, which is more than 38 times the height of Mount Everest. Riding a singlespeed does not mean choosing the easy route. For me it means exactly the opposite. I am thrilled to see if I can tackle a steep climb, I get a lot of satisfaction out of this. There have only been a very few occasions when I struggled and had to push, mainly when I was riding off-road. Riding with one gear means I have to focus all my mental and physical resources at the right time, once I have started to climb there’s no way out. I rode the whole distance on a 32/18 ratio, a common choice for singlespeed mountain bikes. But on the flipside riding long flat roads on a bike that is geared for climbing hills is not only boring for me, mentally it is also pretty exhausting. That’s why I chose the hilly routes over the flatter ones. I wasn’t sure if I should share this here, but I do. My trip around the world was accompanied by another unforeseen challenge two and a half months after I started. In Gallup, New Mexico I had to park my bike and travel back to Germany for a month. My dad had a fall on his bike and passed away after three weeks in intensive care at the age of 71. By any means this was the toughest experience I had in the year, not just for me, but also for my family. The decision to resume the ride in winter conditions was one of the hardest I had to take in my life, but my family encouraged me to continue, and so I did. Back in the US I faced proper winter conditions, riding in minus 10 degrees at times, with temperatures dropping as low as minus 17 degrees at night. And snow and ice. Short days forced me to ride about four hours each day with lights. But I knew it was the right thing to do, I had been looking forward to this trip for such a long time and I think it was in my dad’s interest to finish it. But at times I was struggling a lot, it was not until Adelaide in Australia that I managed to focus properly on the cycling again and ride long distances with ease, right in time for crossing the Nullarbor. The Nullarbor, the famous Nullarbor. Crossing the Nullarbor Plain in Australia proved to be one of the hardest stretches on a singlespeed bike. Water and basic food was only available in road houses which at most were 210 km apart from each other, with no shelter available in between. Although I never attempted to set any records with this ride, I was certainly intrigued whether I could come close to the current record for crossing the Nullarbor on single speed bicycles. The record was set between 29 June and 3 July 2015 by brothers Tyron and Aaron Bicknell. Their ride took advantage of the cold temperatures in the Australian winter months and was completed over four days, five hours and 21 minutes, supported by a crew. Considering I was riding in the peak of summer and had to carry everything myself, I did well doing the same distance in five days ten hours and 15 minutes. While the trip hasn’t been the first attempt to cycle the world on one gear, I am certainly the first person achieving this feat with a mountain bike with all belongings stuffed in a few bags. I joined only a handful of people cycling the world on one gear, one of them being Joff Summerfield, who cycled around the world between 2006 and 2008 on a Penny Farthing. He visited 23 countries and rode about 35,405km, slightly less than an American called Fred Birchmore who finished his epic two-year, 40,000km crossing of Eurasia on a single speed, 42-pound Reinhardt bicycle in 1937. I started reading more about Fred since I arrived back in Scotland and I was pleased to find out that some of his wonderful experiences had nothing to do with the bicycle, an experience I made as well. While Fred lived on chocolate and no proper food (so to make his load not too heavy), I travelled in comparatively more luxury, using ultra lightweight camping equipment to overnight, as well as an app called Warmshowers, where cyclists share their details and offer accommodation for other cyclists on the road. I experienced only positive encounters and learnt a lot about the countries I was travelling though. Most people went out of their way to make my stay with them a positive experience. At times it was hard to say goodbye the next morning. Sometimes I stayed an extra night if I could, or if I needed a rest. I also met quite a few bike shop owners who hosted me, and although I didn’t need their help as my Surly Ogre had almost no faults, I started to document my experiences comparing different bike shops and cultures around the world. This and the way I developed as a person throughout the year are things I would like to write down in a book in the future. Since the beginning I have documented my journey on my social media channels, providing an interesting account of the ride, especially in my video diaries on YouTube, which offer a sometimes intimate account of my life on the road. They can be found at www.youtube.com/reizkultur. I am (almost) back in Edinburgh, currently focusing on organising the Capital Trail, one of the biggest bikepacking events in the United Kingdom. The route for the 240 km Individual Time Trial was devised by me for the Edinburgh Festival of Cycling last year. It takes place for the second time this year starting on 1 October at 7am on Portobello Beach in the Scottish Capital, exactly the same location where I finished my adventure around the world. Entries for the ride that packs in a tough 6000 m of climbing in two days are still open free of charge. I have been inspired by many people on my way around the world, and at times that inspiration has been crucial to carry on. The Capital Trail is my own way to inspire people who are interested in bikepacking and give them an incentive to step out of their comfort zone and try something new. For a year I have been welcomed by the bikepacking community around the world, now it’s time to welcome people to Edinburgh and share my story. More about the Capital Trail can be found at here. GPX files of whole trip can be downloaded at GPSIES here. Segments of the ride are also available on Strava here. The Surly Ogre used for the ride will be on display at the Schwalbe UK stand at the Birmingham Cycle Show (A21) from Thursday 22 September to 25 September. The bike has done more than 15,000km without a single puncture. Equipment for the ride was kindly provided free of charge by Apidura, Charlie the Bikemonger, ESI, Halo Wheels, Ison Distribution, K-Edge (Marleen NZ), Lifeproof, Nordisk, Purple Extreme, Schwalbe UK, Sea to Summit, Shutter Precision, Sinewave Cycles, SpokWerks, Spot, Surly Bikes, Tineli & Yeti. Accommodation in New Zealand was kindly provided by YHA New Zealand, in Scotland by SYHA Hostelling Scotland and by Nullarbor Roadhouse in Australia. Many thanks also to Brittany Ferries, Irish Ferries and Kintyre Express for complimentary ferry tickets. That is no ordinary achievement. Hi! First and foremost, you are one tough nutter! Thank you for your inspirational output for the whole cycling community. I‘m planning to go for a SS bikebacking tour this summer and I‘d like to hear your opinion. Currently my vintage cannondale m300 sports 16 x 32 gear, but I‘d like to install a lighter gear. Maybe 18 x 32? I am cycling through Italy, the Balkans and through the Baltic countries to Finland. Any advice is appreciated! Hi Ville, I would suggest going for a 32/18 as you mentioned. Looking at the Cannondale it is a 26 inch bike, so that would make it a bit easier with that ratio than what I used, you should be ok for most climbs with that.